Garfagnana is a beautiful region in the province of Lucca located between the Apuan Alps and the Tuscan-Emilian Apennines. Visiting this wonderful area also means being in a land full of surprises to be discovered. Garfagnana, in addition to offering a wide variety of landscapes, has many beautiful places and different historic medieval villages, where time seems to have stopped. 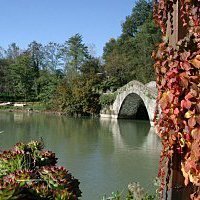 Garfagnana is also the right solution to relax away from the hectic pace of modern life, with the opportunity to discover natural parks, reserves, lakes and natural caves. Moreover, the region isideal for sports and outdoor activities,offering many opportunities for fun and entertainment in close contact with nature. Located less than an hour from the beaches of Versilia, this corner of Tuscany is particularly rich in beautiful lakes, among which are: the Vagli Lake, in depth of which lie the ruins of Fabbriche di Careggine, a submerged village that emerges every time the lake is emptied; Pontecosi Lake, very busy at weekends and during the warm summer evenings; and Lake Gramolazzo, in whose waters reflected the Pisanino mountain, the highest mountain in the Apuan Alps. Places of interest and monuments to visit include: the Devil's Bridge in Borgo a Mozzano, built in the twelfth century by the Countess of Canossa, is one of the most beautiful and ancient humpbacked bridges; Grotta del Vento,located in the valley of the river Turrite, within the park of the Apuan Alps; Antro del Corchia, one of the largest cave in 'Europe with an incredible maze of tunnels and concretions arisen in the course of millions of years; the village of Barga, a beautiful and charming town that is included in the list of the "most beautiful old villages in Italy"; the house of the poet Giovanni Pascoli in the village of Castelvecchio Pascoli, which hosts the original furniture and desks on which the poet worked; and the Rock Ariostesca of Castelnuovo Garfagnana,powerful and charming Renaissance-style building dating back to the twelfth century and still in its original configuration.